12 DAYS OF CHRISTMAS: HOLIDAY GIVEAWAY ALERT! Daily Winners will be announced via email and on Facebook + Instagram Stories Daily! So, there's been gossip about my BBM Extreme program ... here's my response! So I’m here to clear the air and chat about statements of fact about what is undeniably true about the BBM EXTREME program from women who have completed the program ... in their own words in hopes that it will help you to decide to JOIN ME LIVE T-O-M-O-R-R-O-W (YEP, Monday, May 9th) for my last hosted BBM EXTREME Challenge of THIS YEAR! Yes, I Want To JOIN EXTREME LIVE! KELLY Lost 17.8 POUNDS on EXTREME! Hyla lost 15 POUNDS & 20 INCHES on EXTREME! Roseanne lost 10 INCHES on EXTREME! Reagan lost 22 POUNDS ON EXTREME! JOIN ME *LIVE* on MONDAY for the Official 6-Week kickoff of BBM EXTREME! The Bikini Body Mommy EXTREME program starts TOMORROW onMONDAY, May 9th and I'm gearing up NOW for a FUN six weeks with the PRIVATE ACCOUNTABILITY GROUP! As I already said, this is the ONE AND ONLY BBM EXTREME that will be hosted until next year! So if you're on the fence about joining .. now's the time to commit! 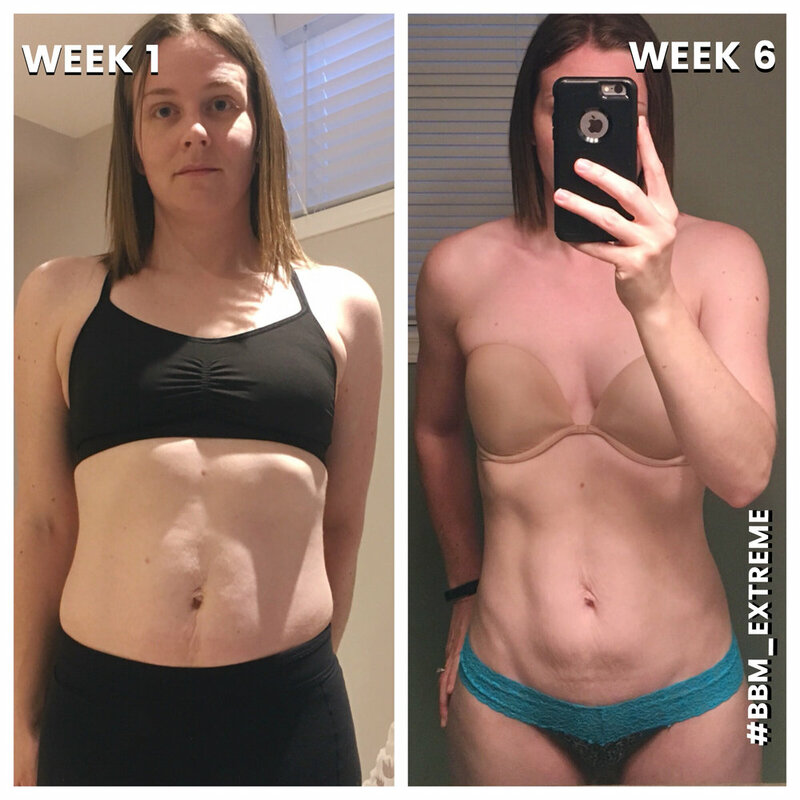 The BBM EXTREME program consists of six weeks worth of workouts, nutrition and mindset exercises to help you bust through your plateaus, kick start your weight loss or challenge yourself in ways you didn't think possible! It's a ONE TIME PURCHASE! Once you buy everything is IMMEDIATELY available and yours to do WHENEVER and AS OFTEN as you'd like! DON'T MISS THE OPPORTUNITY TO JOIN ME LIVE ON MONDAY! Travel. At some point we all have to do it, and usually it's a time when many of us fall off the exercise-wagon! This week while in Las Vegas for the NAB Convention I found myself wanting to skip my own daily workout and know first hand how easy it is to do when you are away from home. Instead of succumbing to my initial desire to just "skip it," I utilized the opportunity to creatively come up with a NO SHOES REQUIRED body-weight only Hotel room workout that had me drenched by the end! How-to: Complete 20 reps of each exercise with only 10 seconds of rest before continuing on to the next exercise in the line-up. Perform 2-3 sets total based off of your time available! Two times, in four years. That is exactly how many "kid-free, over-night trips away" Jason (@BoarshortDaddy) and I have had in the last -- you guessed it, four years! The first trip was 2 months ago. Four blissful, kid-free days the first weekend of February, in New York City. The trip to NYC was to see Jason's favorite comedian Michael McIntyer (you can find our favorite skit of his btw here) and it was my big Christmas gift to Jason last year. We don't have family to help us or give us a break when needed, so the four day over-night trip to NYC was only made possible by the fact that our nanny had moved in with us a few months prior, and although she only works for us a few hours in the afternoons Monday-Friday while we run the daily operations of BIKINI BODY MOMMY™, she had graciously agreed to step-up to the plate so we could make this much needed four day, kid-free trip possible. The result? We honestly hadn't even realized, until the second day that we were away from the kids HOW MUCH we needed that trip together! When you are married, you hear all the time how easy it is in the daily grind of raising tiny humans to forget your own identity, let alone what your marriage and attraction to your partner in life is (outside of your role as "parents") but Jason and I didn't actually realize how TRUE that reality actually was until we had a chance to get away! We always felt "in love" ... we always felt "connected" ... but it wasn't until we were away that we realized how much that "love" and "connection" we shared had become about our role as parents, and not about each other. It took almost the first 48 hours that we were away for us to find conversation points that had nothing to do with work, or the kids... but once we re-found our connection and attraction point, the energy between us as best friends and partners in life was on fire. After we returned from New York, we vowed to each other that we would set aside at least 24-48 hours every 2-3 months to try to get away to celebrate our love. So in honouring our pledge to each other ... When a huge industry conference came up for us to attend in Las Vegas this week, Jason and I seized the opportunity to go, and even though we knew we had other obligations that would limit our kid-free getaway to only a 24 hours window of being able to get away, we booked our trip and made it happen! "When we love, we always strive to become better than we are. When we strive to become better than we are, everything around us becomes better too." While the first trip that we took to NYC took us four-days to fully reconnect as lovers and best friends... This 24 hour trip in Vegas? It was immediate. As soon as we stepped off the plane and checked into our hotel room, there was an immediate exhale and the platonic connection we share as a couple resurfaced in an instant. There was no talk of kids, and only of each other. What made us happy, excited, in love with life... and perhaps more important, in love with each other. In an era where "Relationship goals" has become a coveted hashtag, it is important to remember that the true meaning of much the sought after phrase has nothing to do with a photo... but rather, the connection that people FEEL from the energy shared between two people. And it is important to remember that... THAT "energy" doesn't just manifest between two people who have been together for YEARS, without WORK. Your Marriage. Your Love. Your Friendship. Your Partnership in life ... is too important to put on the back burner. Your partner deserves your undivided love and attention as much as your children do. Your marriage is the foundation on which the stability of your family thrives.... NOURISH IT. Staying Focused ... My TOP 3 TIPS! I wrapped my FREE 90 DAY CHALLENGE 1-week ago today, and I'm not going to lie... it's been a little challenging to stay focused without the daily obligation of stepping in front of the camera to film my workouts LIVE everyday. If it weren't for my VIP INNER CIRCLE group I might have already completely fallen off track! This week with my BBM VIP MEMBERS has not only helped me stay the course, but it has also got me thinking so I've decided to take a moment to share my TOP 3 TIPS for Staying Focused on your Goals! The subconscious mind is unbelievably powerful and if you’re trying to accomplish goals with your body, you need to have it on your side. Similar to a filing system, the subconscious mind stores our experiences, thoughts and emotions for future use. Most of the time it helps, but it may also hinder. Top athletes are famous for tapping into the power of the subconscious. By imagining scoring the winning goal they improve their chances of success. Carve 10 minutes out before you fall asleep each night to close your eyes and mentally envision yourself having already achieved your goal! Working on yourself can be a tough, lonely road. We beat ourselves up and get caught in endless spirals of negative self talk. We blame ourselves and feel inadequate. We ask, why me? Why is this so hard? So, I urge you to protect yourself from the trap of self depreciation. Your body is capable of miracles and one day, in the not to distant future, it will give you the greatest gift of your life. It will achieve amazing things and prove you are powerful beyond belief. Talk to yourself as if you are talking to your best friend. What would you say to her if she were going through your struggles? Be kind to yourself. Give yourself a break whenever you can. If you need a change of scenery, workout in a completely different way or place. Have a massage. If you’re being super strict with your nutrition, but just need a piece of cake, have it. My acupuncturist once said to me, “It matters what you do most of the time, not what you do sometimes”. Not only is it true but being kind to ourselves helps us stay the course. The greatest secret is YOU. As impossible as this journey to self-improvement may seem at times, YOU will find a way achieve your goals. You won’t stop until you do and you’ll be a better person because of it. When you eventually get to the place you want so badly to be, you’ll appreciate your body beyond belief! All of the struggles you went through will make your achievements that much more powerful because it will be a constant reminder that miracles are possible. In the meantime be kind to yourself. Love yourself. Be patient, and amazing things will happen. So my 90 DAY CHALLENGE 7.0 ended 48 hours ago, and I'm not going to lie... I woke up this morning feeling a little lost. You know that feeling? Are You Ready For My Next FREE 90 DAY CHALLENGE? BLACK FRIDAY SALE is ON! Save up to 30% on 7 DAY SURGE and BBM EXTREME! If you've had your eyes on either of my NEW RELEASES but have been reluctant to commit ... now is a great time to add these babies to your home workout Library! Whether you're ready to start tomorrow, or want to wait until the first of the year, these products (and the RESULTS that come with them) are for you! I LOVE Thanksgiving! It is hands-down my favorite holiday of the entire year, and much of the reason for that is the food! You see I am an Irish girl, which means my utter love for potatoes and subsequent desire to eat them (mashed, baked, fried, roasted, scalloped, etc...), courses so thick through my Irish veins - its almost primal. Thanksgiving is the only guilt-free day of the year that can rationalize my personal mass consumption of them, so I am unwilling to give it up(.) Let’s face it. For most of us, Thanksgiving just wouldn’t be Thanksgiving without the tried and true family recipes that have been handed down, generation to generation. DON'T BE A BUTTERBALL THIS THANKSGIVING! Lose 5-10 POUNDS with me LIVE this year BEFORE Thanksgiving! My Last 7 DAY SURGE starts this MONDAY!